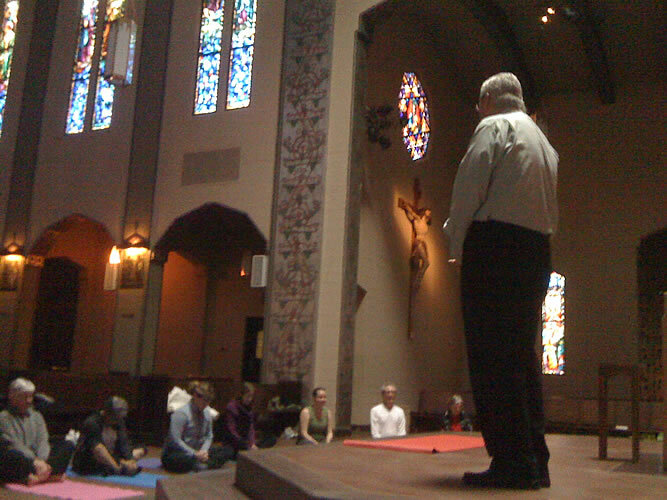 (Excerpt) It was over a glass of wine after choir practice that Anne Kelley, a devout Catholic from Pacific Grove, came up with the idea for a multi-sensory Stations of the Cross that combines yoga poses, live choral musical sequences, 14 commissioned paintings by Pennsylvania artist Eric Armusik and meditation into a single experience. 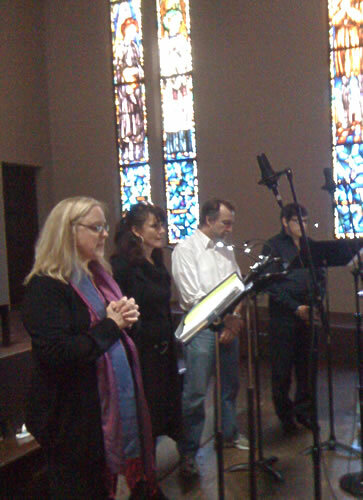 Two years ago, during a spring evening in Seattle, Microsoft lawyer Anne Kelley was lamenting to a friend after church choir practice about their parish's lack of Stations of the Cross. After joking that "Maybe we could be the Stations of the Cross," Kelley, 51, had a flash of inspiration: "Stations of the Cross with Yoga." The yoga enthusiast of 14 months envisioned a guided Christian meditation on the Stations of the Cross using yoga as a way for people to center their whole body in Jesus' Passion. Since starting yoga in 2008, Kelley has found it helpful for centering herself, allowing her to pray more effectively. "Yoga is a good technique for that, focusing as it does on the breathing," said Kelley. She felt combining a sequence of yoga positions with a meditation on Christ's Passion using art, music and the spoken word would provide a profound reflection on the Stations of the Cross. "I was passionate about it from the first instinct," said Kelley. "The most important thing I wanted to do was to have something multi-sensory, including a piece of art, a 'mandala' for people to focus on." Her childhood friend, Cynthia Simon, a San Francisco-based yoga teacher and life coach, was enthusiastic about the project and used her professional expertise to work out a safe sequence of yoga poses for the Stations. "There was a co-creation aspect to it," said Kelley. "I could never have done this without her." After a yoga pose was selected for each of the fourteen Stations, Kelley began her Internet search for an artist. She used Microsoft's Bing search engine to locate the Pennsylvania-based painter she ultimately commissioned to do the 11 x 14-inch paintings of the Stations: Eric Armusik. "We had this ballet on the telephone with the artist after Cynthia worked out the yoga sequences," said Kelley. Her uncle and project supporter, Jesuit Father Larry Murphy, a former longtime teacher at Loyola High School in Los Angeles, requested that the paintings not portray Jesus "as a wimp, because he wasn't." "The painter had a hard assignment: to have it not look like it's yoga, but [at the same time] to be instructive to the person actually doing the physical movement," said Kelley. From the first painting of Jesus standing as he is condemned to death, reflective of the yoga mountain pose, "tadasana," to the last painting of Jesus in the tomb reminiscent of the corpse pose, the images help participants relate to the humanity of Jesus, who fell three times on his walk to Golgatha and died with his arms outstretched on a cross. While meditators see the image, they are also hearing live music performed by a choir and pianist as well as a narrated meditation on each Station written by Kelley. She wrote the meditations in churches that she visited while on vacation in the south of France. On her 50th birthday, she shared the meditation for the first time with her uncle, Father Murphy. Soon after, she debuted the Christian meditation on the Stations of the Cross using yoga positions at her Seattle parish, St. Therese Church, and has presented it five times. 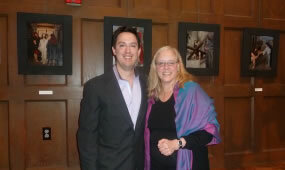 At the artist's reception for the exhibit of the Stations paintings at St. Mark's Episcopal Cathedral in Seattle last month, she finally met Armusik in person, who participated in the multi-sensory meditation along with his wife. 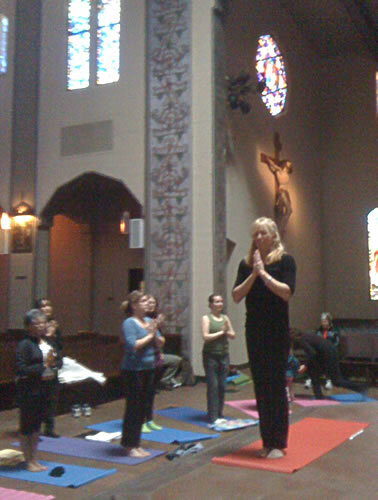 Kelley returned April 9 to Holy Family in South Pasadena, her former parish where she sang in the choir, for the second annual Lenten presentation in the hall attended by 46 people with Simon leading the yoga sequence. The lawyer/singer took her place among the musicians recruited from the parish, singing familiar hymns such as, "Were You There?" Two certified yoga instructors helped participants with the positions, which were done either on yoga floor mats (full pose) or on chairs (modified pose) around the floor's perimeter. All faced an overhead screen which projected each Station's image. "I think it went very well," said Simon of the hour-long meditation, offered free of charge to all, no yoga experience required. "Every time we do it, it becomes more smooth, because we're a team and there is a flow." Simon, an Episcopalian, said partnering on the yoga Christian meditation project brought the Stations of the Cross to life for her. "I actually for the first time really walked the Stations, and I really began to understand what they were [with] Jesus being human," she noted. In addition, "every station is to me an analogy of something: 'I've fallen. Jesus fell and got up so I'm going to get up right now;' 'I've got pain and suffering [but] it's all ok because I have this role model [in Jesus].' "Even at the end, dying on a cross, there's life again. To me, this [represents that this] life thing is ok even though it's a challenge," said Simon. Surveys collected following the meditation reveal that participants like the communal experience aspect. "They really like doing it in community. I want to enable that experience," said Kelley, who has submitted her Christian meditation using yoga to Paulist Press for book/DVD publication consideration. "I thought this was absolutely fantastic. 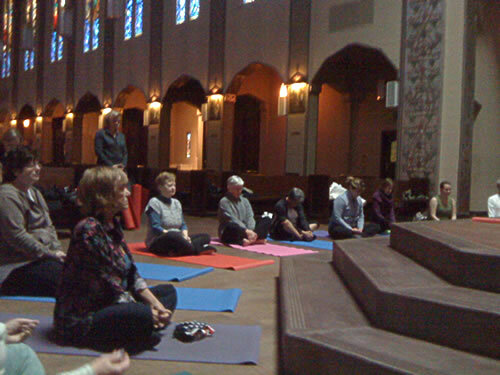 I really enjoyed it," said Marlene Kurowski, a Holy Family parishioner and yoga teacher who attended the April 9 event. "It was a wonderful inter-weaving of music, art and yoga. I hope they grow this and offer it at other churches. Even for people who didn't have previous yoga experience, it was a great way to get a first exposure to yoga." Doug Finney, a Holy Family parishioner and first-time yoga participant, said he thought the meditation was very peaceful. "I enjoyed the tranquility. Tying our faith together with that was just amazing. I'd do it again," said Finney. "I wish we could do it every week of Lent," said Desiree Bartlett, also from Holy Family. "I like the idea of physically interpreting the Stations of the Cross because you internalize it into multiple levels: body, mind, heart and breath. I think all churches should offer it." Ginna Schimmoller, an American Martyrs parishioner from Manhattan Beach who came at the invitation of her sister, Mary Schimmoller, volunteer coordinator at Holy Family, said she found the experience very touching. "I look forward to it next year, already," said Ginna. "I thought it was a beautiful way to pray with my whole mind and all of my senses," added Mary. "I found it very moving, very connecting." Holy Family parishioner Ruth Hernandez said she became emotional on the tenth Station when Jesus is stripped of his garments. "Tears just started coming down," said Hernandez. "I found this to be incredibly touching," said Teresa Tiffany, a parishioner at Immaculate Conception in Monrovia who attended after seeing an announcement in a local newspaper. "I loved doing yoga with the stations, especially the movement --- the raising of the hands was such a beautiful form of praise and prayer," said Tiffany. "It was also very moving to be moving through the Stations. There was a great connection there. The background music was awesome and the familiar songs were very touching. It was very well done." Editor's note: A future exhibit of the Stations of the Cross paintings commissioned for the Christian meditation using yoga is being planned at Holy Family Church in South Pasadena. For additional information, log on to www.bodyinprayer.com. Hamburg artist Eric Armusik finished painting a 15-panel Stations of the Cross on Feb. 16, the day before Lent, so the panels will hang in St. Therese's Church in Seattle, Wash. for Ash Wednesday. A private client for an upcoming book on the Stations of the Cross and yoga meditation initiated the project, and Armusik has been working on the 11 by 14 inch panels since Nov. 14. Once the finished panels are completed, they will sit in a permanent collection in the church, he said. "I have always wanted to do work for the church. From the time I was a child I would stare at the ceiling of my church that had an enormous rendition of Raphael's 'Transfiguration.' I knew I would be able to do that someday and I will get my chance," he said. 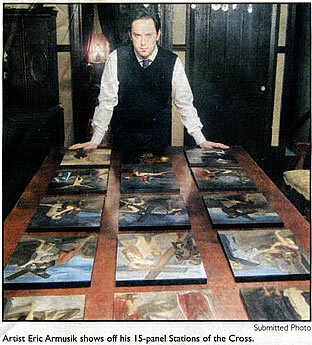 He decided to take the impossible task of creating 15 traditionally inspired, realistic paintings in three months, and break the job in half. Eight panels were completed before Christmas and seven before Lent. "Initially I tried to look at this project internally to really try and feel how Christ would feel going through these terrible events. I tried to provide a creative environment in my studio conductive to painting these spiritual experiences, so I could be true to the subject matter," he explained. Armusik said he used his experience as a graphic artist, by applying the knowledge and skills he has in Photoshop. He was able to have models pose, then with each figure, and construct them in an environment, where he could move the figures or substitute them with new ones if something would not work in a pose. "Technology was an incredible resource on this project," he said. "If I was on the road, I could upload pictures to my iPhone and send them to my client while we were on the phone." What makes Armusik's work unique, is he meditated on the terrible events he was painting. "I am a romantic painter," he expressed. "I live for the emotional experiences in my work. A lot of artists paint what they see; I paint what I feel. I want people to feel what Christ is feeling." In order to keep on schedule, he estimated that he had less than 300 hours of sleep since the project began. He drinks coffee five to six times during the day, even as late at 11 p.m. to get him to the 2:30 a.m. finish, only to get up at 5:30 a.m. to start work again. "All in the name of great quality art," he said. One thing he has gained through this experience is confidence in himself and that he can do anything. 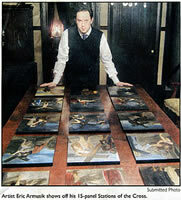 "I can paint several portraits of Christ over a few days, and I know they'll all look good," he said. "The other day, I was informed by someone of something even more profound," he said. "They said that long from now these painting will sit on the walls in a church and they will become sources for thousands of people to pray to." He then wondered whom he would inspire. He said the thought is quite humbling.